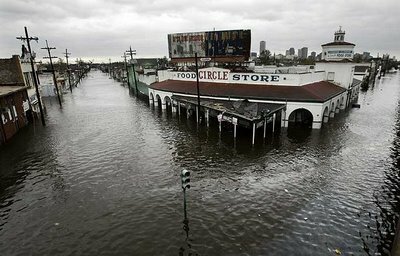 The local officials said they could not order a mandatory evacuation in a city as poor as New Orleans, in which more than 100,000 residents have no cars, but they urged people to find some way to escape. As far as I know, that statement was just as true on August 27, 2005. And telling people to leave is not the same thing as helping them to leave. In the last few days, I've often been told that no one had any idea how bad this storm was going to be. That comes as a surprise to me; I sat up obsessively 'til 4 AM on the morning of the 29th, reading every scrap of news or gossip I could find. Everything I'd heard in the media, from the 27th on, led me to believe that New Orleans was going to be completely submerged. Bush, of course, lied when he said that no one foresaw the levees being breached. Much proof for this has been offered by bloggers, and even by some major media. But even if that proof didn't exist, there was no good reason to consider the levees impregnable, and every reason to consider them vulnerable. Bush's statement says more about the ease and fluidity with which he can lie, even - or especially - in moral circumstances that would bring a normal human being to the breaking point, than it does about the sturdiness of New Orleans' levees. Why didn't FEMA function properly? Because it wasn't supposed to. What Republicans like to do is infiltrate public agencies and loot them, and then run them into the ground in order to prove that government programs don't work. And that's what BushCo did to FEMA. They got rid of a competent administrator, and replaced him with people who had no experience whatsoever in disaster response (unless you count defending George W. Bush against political inconveniences). If Congress and President George W. Bush hear a unified call for action....Restoring coastal Louisiana would protect the country's seafood and shipping industries and its oil and natural-gas supply. It would also save America's largest wetlands, a bold environmental stroke. And without action, the million people outside New Orleans would have to relocate. The other million inside the bowl would live at the bottom of a sinking crater, surrounded by ever higher walls, trapped in a terminally ill city dependent on nonstop pumping to keep it alive. Funding the needed science and engineering would also unearth better ways to save the country's vanishing wetlands and the world's collapsing deltas. It would improve humankind's understanding of nature's long-term processes--and the stakes of interfering, even with good intentions. And it could help governments learn how to minimize damage from rising seas, as well as from violent weather, at a time when the U.S. National Oceanic and Atmospheric Administration predicts more storms of greater intensity as a result of climate change. There's no point asking why Bush did none of these things; we know him well enough now to know that it would be shocking if he found any of these ideas compelling enough to compete with the voluptuous pleasure of big tax cuts, and the vicarious thrill of torturing and maiming and killing Iraqis. But why did Bush wait so long to respond? Force of habit, perhaps; he certainly displays a pattern of hiding from crises. Or maybe, as some have suggested, he was hoping that public anger would turn against Louisiana Democrats if services weren't forthcoming. To say that Bush thinks in moral terms would be insane; there's no evidence that everyday Americans have any reality to him as ends in themselves, rather than as means to his ends. What's obvious - what no reasonable person can deny, and what even suprememly unreasonable people like Newt Gingrich understand - is that for all BushCo's talk of "homeland security," nothing has been done in the last four years to improve response time and efficiency in a disaster, whether natural or man-made. If you can't evacuate people after a hurricane - a hurricane that you watched travel towards you at twelve miles an hour - you can't evacuate them after a dirty bomb detonated with no warning. Any terrorist who is thinking of attacking us must be delighted to learn that Bush's incompetence will act as an awe-inspiring force multiplier. It's often claimed that George W. Bush has asked for no sacrifices in this time of war. On the contrary, he's asked us to sacrifice our humanity and our compassion. He's asked us to sacrifice our privacy and freedom, and our respect for our fellow citizens. He's asked us to sacrifice every irreducible ideal - and there were few enough of them, God knows - on which this country was founded, and whatever fragile steps we've taken towards implementing them under the law. He's asked us to sacrifice any religious truth that would interfere with the dreary, mechanical pursuit of redundant wealth and false security. He's asked us to sacrifice our souls and our conscience, in exchange for his snake-oil promise that we'll never have to suffer the consequences of our own inhumanity. He's asked us to sacrifice our present for his future, and our future for his present. Bush admits that he didn't respond appropriately to this disaster, and we know that this failure - if it was a failure, and not a policy, or a whim - killed people by the hundreds, if not thousands or tens of thousands. In a "civilized" country, Bush would've resigned in disgrace by now. In an "uncivilized" country, he and his goldbricking cronies at FEMA would be hanging by the neck from lamp-posts. But only in a soulless country - one that's turned its back, essentially, on itself - could there be any possibility of letting him remain in power. UPDATE: Welcome, Digby readers. I'm honored! I hadn't started reading you when this appeared originally, so thanks for reposting it. Damn, but you can write. I think the truest, most poignant part of the post is your discussion of the sacrifices Bush has demanded of us. And the sadest thing is that we were so willing to make those sacrifices, if none else. Well written post, Phila. Bravo. I found the second-to-last paragraph of this post on Digby's blog and came over to see the rest. You are one fine writer and I'll come back. That paragraph is about the best thing I've read about him. Thanks for the kind words, everyone. Much appreciated. I found your site through Digby and I'll definitely be back. Another Digby reader who will return here in future. Beautiful expression of what so many of us feel. also via Digby... the section he quoted about the sacrifices brought chills. So very true. I've had a glance around at some of your other stuff, also excellent. Sigh, adding yet another "must read" blog to the list. Phila, I just stumbled onto this blog and I am so inspired by your words. I feel ashamed though for my own apathy in the face of what I see as tyrany. I am also ashamed on behalf of my country for what we are doing to our world. I will be forwarding your post on to others. Please keep writing. I too came to your site through Digby. Another reason to read him (her?) daily and now you. Jeez...I hardly know what to say, except that I'm very flattered. Thanks so much for taking the time to visit, and to comment. Another daytripper from Digby checking in. Magnificent writing! I won't repeat the praise so well expressed by others already, but I will note that I just bookmarked the site. 'Nuff said. I don't know what web etiquette is nowadays. Do you mind if I quote an excerpt from this entry in my blog? With a credit and link, of course. Thank you. Feel free to use whatever you'd like.